This year I am linking my Christmas house tour to Jennifer Rizzo’s Holiday House walk 2015 link party. Please stop over to her blog to see other wonderful holiday homes by clicking on the image below or by clicking Here. For those of you who don’t know me, I am a decorative painter. I will paint something and then make a pattern and instructions so that others can paint my designs. I also enjoy painting other people’s designs. If you are interested in learning to paint, decorative painting is a great way to start. You can contact the Society of Decorative Painters to find a teacher or a chapter in your local area or you can contact a local painting shop to see if they offer classes . Also today there are many online classes that you can take and learn at your own pace. Pink is my favorite color, when you approach my house in the evening it has five trees with pink lights on them. The nativity that you see in my front yard is a pattern by Juliet Martin. In the original pattern the figures were about seven inches tall, I enlarged them for this outdoor nativity. You can read more about it on my Packing up Christmas 2014 blog post. When you come to the front door you will find these two angels dressed in pink to greet you. I had an idea for the angels, but wanted them to also look like they are a part of the nativity so the faces are from a Juliet Martin pattern. You will see that I do love angels, and these ladies grace my front entryway. The angel tree is a Rosemary West design, the other angels are Byers Choice. You will then enter my living room and dining room which is one large room. The room is painted a soft blue-green-grey called Rain by Sherwin-Williams. The room has lots of white with pink, golden-yellow and turquoise accents. The tree on the table has pink lights and lots of pink balls, under it are more angels. To the right of the table are these angels on the wall by a local artist Diane DeWees. The rose sign is by Ginger Edwards. The nativity on my mantel is a Juliet Martin design, it is one of my favorite Christmas pieces. If you would like to learn how to decorate your mantel you can look at my Tips on Decorating your Mantel blog post and if you would like to find out more about the banner go to my Playing with Glitter blog post. These are a few close up pictures. My pink Mr. and Mrs. Santa are to the left of the fireplace. This is the first year I put my holly tree in the living room. I have snowball lights on it with pine cone ornaments, ice cycles, and birdcages. Through the tree you can see the white display case that holds my Margaret Furlong angels. I leave them out all year. On my dining room table I set up a buffet of goodies using different cake stands and glass ornaments. My main tree in the room sits in our front window. Each of the focal glass ornaments on it reminds us of someone special in our life, a special memory of a place we visited or of something that we enjoy doing. The tree is finished off with lots of pink ball in many sizes and shades. If you would like to learn more about decorating a tree check out my Tips on Trimming Your Christmas Tree blog post. When cabbage patch dolls were popular I made these dolls for my two aunts. They had fun with them taking them out to eat and going for rides in their car. When they passed away they came back to me. They always sit in a place of honor in our home. 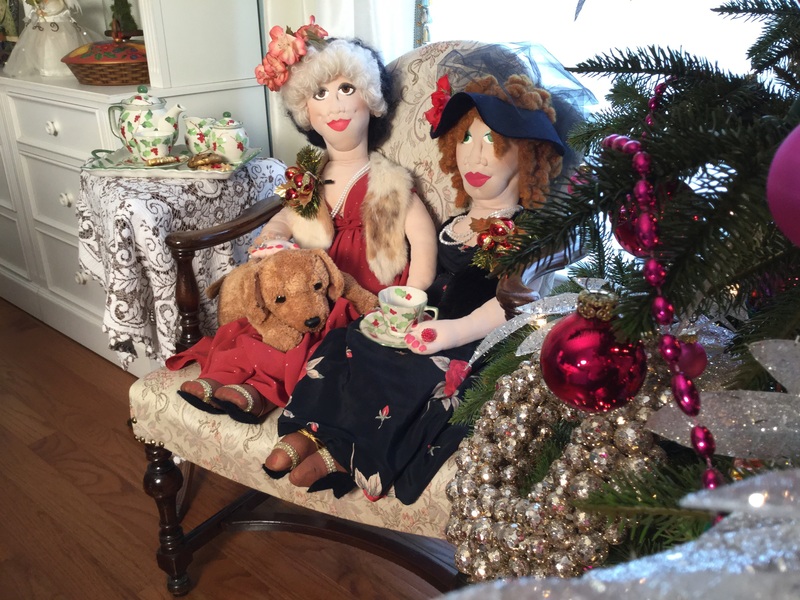 They are enjoying cookies and tea and would love for you to visit with them. The bookcase is holding a number of my designs that have been in books, magazines or are pattern packets. Our kitchen and family room are also one large room. Red is the predominate color in the room, so you will see it in a lot of the decorating. I love how cheery and festive everything is when you use traditional red and green. This year I put two trees in the family room the one has lots of crystals on it and mercury balls. The top of the entertainment center has glitter houses and more Byers Choice Carolers. I love the Merry and Bright glitter garland that I made this year. I like to have a small nativity in this room since this is what Christmas is all about. I did a snowy woodsy theme on this mantel. The little house is a Havtahav by my friend Amy Mogish, you can see more of her work at Classic Amy Joanne. I love how he looks on my mantel. I just love this Santa which is a Shara Reiner design. My father was a clock smith and jeweler, everything about him reminds me of my father. The main tree is this room is decorated in golds and reds and has hand painted ornaments by myself, family and friends. The sleigh was one of the first things I painted as a gift for my mother. She kept it out all year. Now that she is gone I have it as a sweet memory. This is a view of the kitchen from the family room. On the island are my ornaments from the book “Celebrate Christmas with Della and Friends” and my service advent tree. To learn more about it go to my Advent Tree of Service blog post. These hutch is between our kitchen and family room. The box with the cardinals is another project of mine from the “Celebrate Christmas with Della and Friends” book. These two projects of mine were in PaintWorks magazines. This canvas is a Classic Amy Joanne design which I painted with her. You can read more about it at my Making it Yours blog post. These two fun characters I created with Wendy Young of Olde Moon Lane Primitives. If you ever get a chance you will want to take a class with her. My house has a four seasons room that I use for my painting studio. I put a small tree with pink light in it and covered it with fun funky ornaments and “Krinkles” by Patience Brewster. The rest of the room is just too scary to show you at this time. You know how it is when you are creating. The little angel at the bottom of the picture designed and painted by Marjorie Harris Clark. As you go out my back door you will find Santa at his workshop. This is a Maxine Thomas design. Thank you for taking the time to tour our home, we hope you enjoyed visiting. We wish you a very Blessed Christmas season and a Healthy and Happy New Year filled with New Adventures. These are blog post of last years tour if you would like to see more. Jane….Thank you so much for the wonderful tour!! Each photo is beautiful. I especially love the Juliet Martin nativity…..what a treasure. I have your “Joy” cardinal pattern out to paint….and will definitely look up your project from PaintWorks with the male and female cardinals. I love both pieces. Wishing you and yours a most blessed Christmas!! Thank you Dorothy, so glad you enjoyed the tour. The Juliet Martin nativity is my favorite decoration. It tickles me that you are painting my designs, thank you so much. Christmas blessings to you and your family. I actually looked three times, it’s so beautiful and my style. So many things I loved ,too many to mention. So creative and inspiring. Thank you Jane for sharing. Thank you Mim, I would love you to stop in if you are in my neighborhood. Christmas blessings to you and your family! This was such a beautiful tour….so welcoming and joyful and inspiring and fun! What a festive home you have! I love your holly tree!! Where did you find it? Thank you Jennifer, I do enjoy decorating my home. I bought the tree a number of years ago at a local Christmas shop which recently closed. The box says the tree is from Lakeland florist supply inc. There address is 7035 Washington ave south, Edina, Minnesota 55439. The po # is 3366 and the item number is .s19146. I hope you are able to find it. May you and your family have a very blessed Christmas.